THIBODAUX, La. 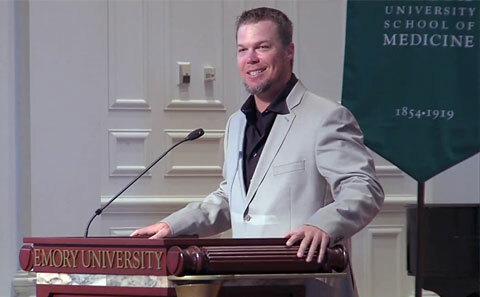 — Former Atlanta Braves third baseman, Chipper Jones, will be the guest speaker at the Nicholls State University baseball program’s First Pitch Banquet on Jan. 31 as part of the team’s annual celebration of its past and present. Source: Daily Comet. Photo shows MLB legend Chipper Jones speaking to Emory seniors in May 2013. The day begins at Ray E. Didier Field with an Old-Timers’ Game at 11 a.m., followed at 1 p.m. by a matchup between program alumni and the 2015 Colonels squad. At 7 p.m. at the Cypress Columns in Gray, the team holds the banquet, featuring a live band, silent auction, dinner and cash bar. Jones will serve as the guest speaker. The doors open at 6:30 p.m.
Tickets are $75 per seat and $600 for a table of ten. A sellout is expected, so fans and supporters are encouraged to reserve their seats early. Jones is a former MLB third baseman who played for 19 seasons with the Atlanta Braves. Although initially a shortstop, he spent most of his career as the starting third baseman for the Braves. In 2002 and 2003, he played left field before returning to third base in 2004. Jones said in March 2012 that he would retire at the end of 2012. Many baseball writers anticipate Jones will be inducted into the Baseball Hall of Fame as soon as he becomes eligible. Playing Field Promotions is a booking agent for motivational sports speakers and celebrities. If you would like to book Chipper Jones for a speaking engagement or personal appearance, contact Chipper Jones’s booking agent for appearance & speaker fees at 1.800.966.1380.